Earn up to 20,760 reward points. Powerfully advanced studio interface with 12 Class-A preamps. Orion Studio is without a doubt a star in Antelope Audio’s new line of Thunderbolt & USB audio interfaces. Its 12 Class-A Mic Pres make it the one and only piece of gear you’ll need to record a full band and do it like a pro. Just like Zen Tour and Goliath, Orion Studio features our FPGA powered, hardware-based vintage FX, making it the top choice for professional guitarists on the quest for crafting the perfect tone. This best-selling interface also includes Antelope’s traditionally stunning AD/DA conversion, powered by our very own, world-renowned 64-bit Acoustically Focused Clocking (AFC) technology for jitter management. Orion Studio’s secret weapon is the extremely powerful Field-Programmable Gate Array (FPGA) device. Its massive parallel processing capabilities are far ahead of DSP chips used in similar devices. Through smart algorithms, oversampling and custom-tweaked models, the FPGA provides the lowest latency possible, allowing you to create up to four independent, zero latency mixes. Those can be easily assigned to any output including the two separate headphone outs. Enjoy the true sound of classic guitar amps with Orion Studio’s hardware-based Vintage FX. Antelope Audio’s custom FPGA makes Orion Studio the #1 audio interface for professional guitarists by being the perfect platform for our integrated vintage and contemporary guitar amp & cab simulations. Developed in collaboration with Overloud they bring precision and audio realism to a whole new level, allowing artists to experiment with multiple speaker configurations, mic placement and EQ settings. Our innovative RealModel technology allows us to vividly rebuild the true sound and behavior of classic analog gear. Playing and recording guitars has never felt so real! Orion Studio features an exciting new approach to control, allowing convenient device management from various access points, including multiple computers in the same network. The interface is fully controllable via user-friendly Software Control Panel. An intuitive iOS / Android mobile app gives you even greater freedom by granting full mic pres control from a smartphone or tablet. Orion Studio can work with any DAW on the market via Thunderbolt or USB. Orion Studio’s FPGA powered Thunderbolt and custom USB guarantee the lowest sound latency on the market. The device’s massive parallel processing capabilities allow fast, simultaneous streaming of multiple audio channels and instant effects processing. Thanks to the variety of digital and analog I/O, combined with the flexible routing matrix the device is easily connectable to various outboard gear. 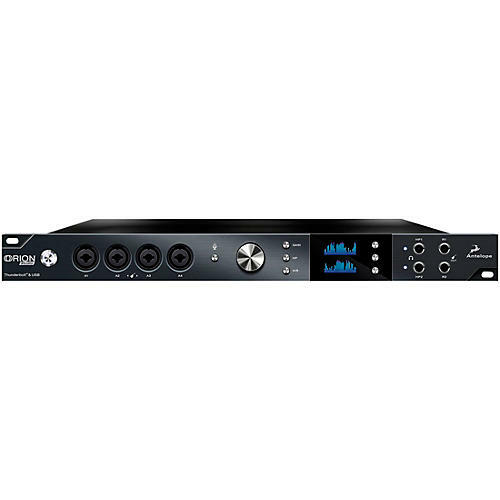 Upgrade your studio with Antelope's renowned clocking and conversion.